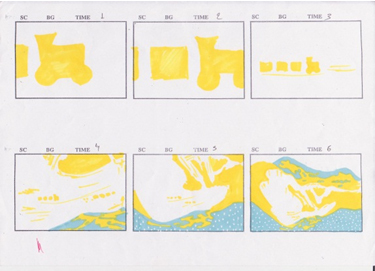 Storyboard from animation inspired by Betchworth by Noel Rooke, 1921. On February 27 this year, 33 students received a brief from London Transport Museum: bring a London Transport poster to life in a 30 second animation. The students visited the museum and study collection at Central Saint Martins to see the original posters and to learn more about their background. All the posters had been produced by former students at Central Saint Martins. Duplicate copies had been transferred from London Transport Museum to Central Saint Martins as part of Access to Art. Students drew further inspiration from their visit London Transport Museum Depot in Acton Town. Museum volunteers led tours of the poster and artwork stores and showed them more work by former students at Central Saint Martins. Students then worked in small groups to plan, design, animate and edit their short films, using animation techniques including stop motion, digital cut-out and 3D computer modelling. 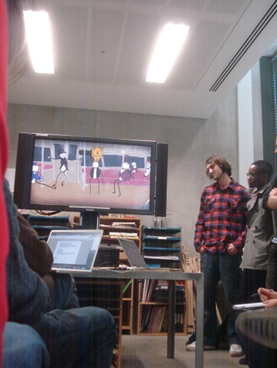 The teams presented their finished animations on March 13th. Thanks to the students and tutors for all their hard work on this exciting project. Enjoy the animations and please remember to tell us what you think! Brilliant animations! Love the way they make me look at the posters differently and bring them to life. Congratulations to the very talented students.